The British can finally celebrate. On Sunday, Andy Murray became Britain’s first Wimbledon men’s singles tennis champion in 77 years with a hard fought 3 set victory – 6-4, 7-5, 6-4. On the famous grass court at London’s Wimbledon tournament, Scot Andy Murray beat #1 ranked Novak Djokovic. Murray thus became first British Wimbledon men’s singles tennis winner since Fred Perry last won in 1936. Murray was the local favorite as it seemed all of Britain was watching and hoping the long dry spell would finally be broken. Andy Murray had a formidable foe in Novak Djokovic, who himself was a six-time Grand Slam winner. The tennis match outcome wasn’t as lopsided as the straight set battle may first appear. Top seeded Novak Djokovic played tough for the entire 3 hour, 9 minute match at the All England Club. But eventually, second seeded Andy Murray prevailed. The celebs were also out in force, anxiously watching all around Wimbledon’s famous Centre Court. A few of the notable celebrities spotted enjoying tennis on the warm and sunny London day were Victoria Beckham, actors Gerard Butler and Bradley Cooper, soccer star Wayne Rooney, plus Prime Minister David Cameron. Novak Djokovic did have chances. He led Murray 4-1 in the 2nd set as well as 4-2 in the 3rd set. Murray was the better player and broke Novak’s serve seven times to erase the two large deficits. 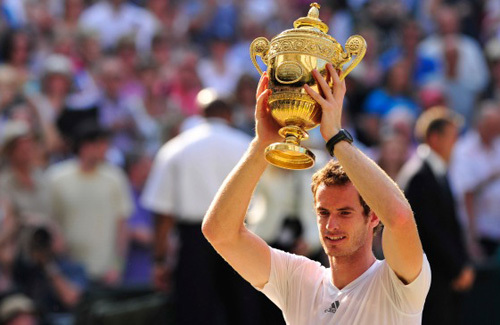 Murray follows this year’s Wimbledon championship after winning the Olympic gold medal on Centre Court last summer. Andy also won his first Grand Slam title at the U.S. Open last summer. ← Is It Unethical To Have An Ethical Will?